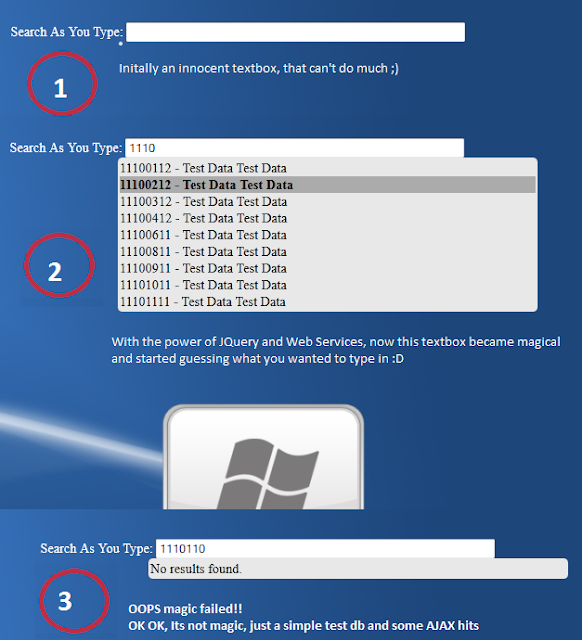 This post is for search as you type functionality (on demand loading) for ASP.NET site using JQuery and ASMX web services. Step 2: Send an AJAX hit to server to get search results corresponding to user input. Step 4: Separate handling for down/up key for traversing between search results, enter and tab keys for selecting specific search result and escape key to remove search result. AJAX calls to ASMX web service. · Here if I would have used keyup event in place of keydown, It wouldn’t have been possible to select result by pressing tab or enter key as in that case, event has already been occurred thus prevent default can’t work. · Code in red (see above) is a known bug :( u can c it as coding exercise): This code block handles backspace key but assumes that user will press it end of text only and not from between. I have this problem because on keydown I don’t have final value of textbox, I just have the keycode of key pressed, so I am forced to assume that key pressed is at end only(I’ll update this post once I find the proper solution). · Code in green is heart of this all, it sends request to an ASMX service and captures response coming from there. · In code blocks that handle up/down key there is logic to keep selecting search result records in loop, means if down key is pressed and last result found was currently selected then automatically selection will get changed to first search result. There is nothing typical in above ASMX code, its just about fetching records from database and then generating html corresponding to records retreived. One thing worth noticing is that one div is created corresponding to each search result and they have been given ids in incremental order. Other thing is method ‘GetDataForIntellisense’, implementation of this is upon you. Current code expects this method to return a datable with a column named “code”. In above css, class ‘divPredictedResultsContainer’ has two lesser known attributes, namely z-index and border-radius. Z-index is to specify stack order of an element. It lets results to float above other contents and thus you don’t need to reserve space for search results and can show search results without disturbing other contents of site. Border-radius property is for giving rounded corners effect to div. This might not work in older browsers. Nice one. IS there C# version of this please?